This silver colour mini cross necklace is the perfect accessory and it's limited edition. It features a small brushed silver coloured mini-cross on a 24" (61cm) silver coloured mini bead chain. The cross pendant is 1.3cm wide by 1.3cm tall and 1mm thick. 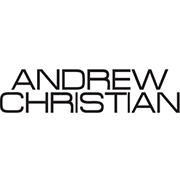 The front of the cross is engraved with "Andrew Christian".